With a ’ Structured Water Under The Sink product, you will enjoy drinking and cooking with water that is balanced and hydrating. 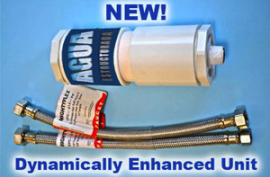 You can add an Under The Sink product to any filter system you have to improve your drinking water. Your body will feel the difference. The Under The Sink product is the perfect choice. It’s easy to install, it can be removed quickly when moving, and it will serve to give you clean Structured Water for dishes, cooking, drinking water, cleaning and more right from the kitchen sink. The Under The Sink product should be installed on the cold water line. When turning on the hot water, it will mix with the cold water and the water coming out the faucet will be structured. You now have the choice of purchasing our original units, and/or the choice to purchase a Dynamically Enhanced Units with all the magic of the synergistic properties they bring to the units. This is easily installed in the water line this side of the water meter. The benefits from this installation is the unit's ability to give balanced water at each water faucet, remove unwanted chemical buildup in the pipes and other units as well as the benefits to either hand watering or sprayer units in gardening.The line of Dynamically Enhanced Units have a flow-form inside that is the same structure and size as the flow-form in the original units, but is made from a combination of proprietary materials that dynamically enhance the energy of the unit and create a static energy that exists even before the water flowing through the unit is structured. Nothing physical is being deposited or physically added to the water. What is happening is that the structured water is being dynamically and energetically enhanced by the energy in the added materials. The Under the Sink Structured Water Unit is for the person who wants the full effects of dynamically enhanced structured water straight from their tap. The line of Dynamically Enhanced Units have a flow-form inside that is the same structure and size as the flow-form in the current units, but is made from a combination of proprietary materials that dynamically enhance the energy of the unit and create a static energy that exists even before the water flowing through the unit is structured. When showers and landscaping are not a consideration the under-the-sink unit is a perfect installation. It is designed to be used in place of filters, R/O units and charcoal filters. The filters can remain if debris and sediment is a problem. However, these are very seldom needed and can remove beneficial minerals (dissolved solids) contained in the source water. This unit dispenses water in the optimum manner for the balanced water to reach your body in its optimum structure, through the cold water outlet at your kitchen faucet. This will give you the best taste, maximum absorption of the water through the cell membranes in your body and the greatest health benefits of naturally balanced water. It is easily installed by anyone with a minimum plumbing experience. There is usually a small pipe underneath the kitchen sink which can be removed on the cold water side. A flexible hose on each end of the unit is connected to the two exposed ends where the piece has been removed. This unit is also advantageous for anyone living in a rental unit because it can be easily removed and the old pipe can be replaced. Then it can be reinstalled in another rental unit or home. Agua Estructurada offers a MONEY BACK GUARANTEE ON ALL PRODUCTS if you are not 100 % satisfied with our products. You have 90 days to return your device without any risk. Copyright © 2019 Organos GC S.L. All rights reserved.